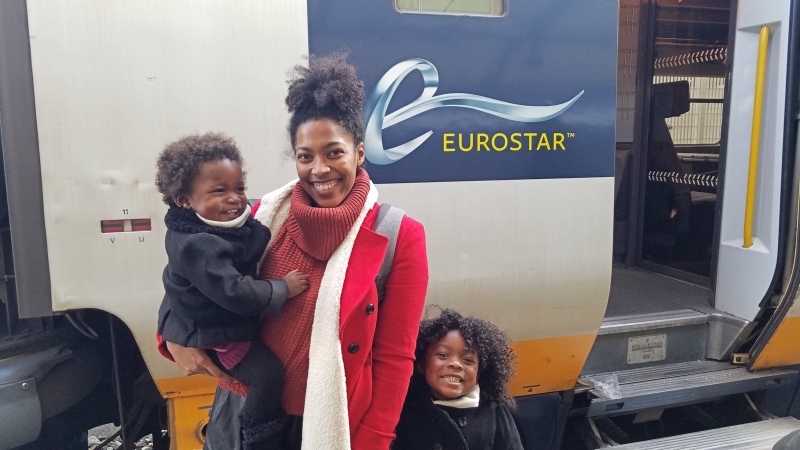 We embarked on a four-country trip through Europe with an infant and a toddler. This might sound expensive and daunting but it wasn’t. We made country hopping affordable by traveling throughout Europe by train. Here is why train travel is Europe is the best! Getting to Europe will be the most expensive part. Always start your trip by flying into the cheapest city on your itinerary. For our most recent trip we went to Amsterdam, Paris, London, and Brussels. Scoring a deal on Delta for $400RT to Amsterdam, it was the cheapest city to fly into so that’s where we started. Here is are the websites with the best flight deals. When looking at our options to get from Amsterdam to Paris, the train was the clear winner. While the cost for a budget airline was 37 Euros, the cost for the train was 35 Euros. I know what you are thinking it’s just 2 Euros more. However, when you add the cost of children and luggage the cost of the flights skyrockets. The budget airline charges full price for kids 2 and up. They even charges for lap infants under 2. The lap infant was 20 Euros so the cost for our family of 4 would be 131 Euros. Budget airlines offer minimal free luggage. Most only allow 10kg (22lbs) of carry-on luggage and no checked luggage. While this can include a stroller, it would take the place of any other type of luggage you had. The stroller allowed can also only be an umbrella stroller, if you have a different stroller or car seat/stroller combo you would have to pay extra. Adults are allowed the same 22lbs of carry-on luggage. If your bag is heavier you will need to purchase additional weight starting at 13 Euros.The train however is free for kids under 4 and kids 4-12 are 50% off. There are also no restrictions on the weight or the amount of luggage you bring. Our total train cost was 70 Euros while we would have paid at least 144 Euros to fly a budget airline. Unless you are entering or departing London via Eurostar you do not have to go through security or customs to travel within Europe. You simply arrive to the train station a few minutes before departure, board, store your luggage, and find your seat, if you have one assigned. This alone cuts hours from your transportation time you’d normally spend arriving to the airport 2hrs in advance and then going through customs and immigration upon arrival. Often times flying into large cities like Paris and London leave you in the outskirts of the city. Heathrow International Airport is 45mins outside of the city by public transportation and takes even longer driving due to traffic. St. Pancras Station on the other hand leaves you in the heart of London with many hotels nearby. This saves travel time on your arrival and your departure. Traveling Europe by train means you’ll get to see parts of the country you otherwise wouldn’t see and surely not from the sky. Enjoy the beautiful country side of each country your train passes through and have a relaxing ride. Most Europe train systems offer free wi-fi so you can stay connected on your journey. Many also offer power outlets to charge all of your electronics. You will also be able to send and receive text messages or make a phone call in an emergency. There are many different Europe train systems. Here are are a few we have traveled by and had great experiences on. I hope you have learned by it’s best to travel Europe by train and the best Europe train systems. If you found this article helpful please share it! This is such a great resource! Thank you for showing the actual break down in the cost difference between using a budget airline and traveling by train. I love love LOVE the concept of your blog, because I haven’t even had a little one yet but my husband and I hear all the time that traveling life ends once the babies are born, and it’s just something we refuse to accept and believe. My mother traveled with my brother and I all the time! Can’t wait to read more posts about your time with your family in Europe! Wow. This was so informative. I had no idea it cost so much, especially for young children, to travel by air. It’s literally insane. Having to choose between luggage and a stroller? No ma’am. These tips are definitely good to have in mind when traveling. I honestly never even considered depending solely on public transportation when traveling abroad, but evidently it’s the best bet. Thank you! Great tips! First time I went to Europe we did everything via bus. Lol so slow but got to see a lot. This sounds much more interesting. Thanks for the train tips! Love your blog and beautiful family!